Sometimes, as a cancer patient, you want to blend in with the crowd. Blend in with those around you who have hair. Because, after all, being bald attracts attention and unwanted stares. Being bald equates sickness. And no matter how sick I feel, I don’t always want to look it. Sometimes, it’s hard to feel like a woman when the features that amplify your femininity fade away. After being diagnosed with cancer in January of 2012 and learning I would lose all of my hair, I was devastated. I had just reached the point where I was obsessed with my locks, so facing the reality that they would be gone in a matter of weeks was calamitous. That was 14 months ago, and since then, I have lost my hair a few more times. But, never once had I grieved my eyebrows or eyelashes. In my second season of treatment, my hair loss became more of an inconvenience rather than devastation. I had gotten pretty used to it. However, this time around, chemo decided to take a little more hair with it. This time, I lost all of my locks… as usual, the new curls on my head and the hair on my legs and arms. But, this season, even my eyebrows and eyelashes disappeared. Everything. The only hairs I hadn’t been used to saying goodbye to were my brows and lashes, and boy did I realize what an adjustment that would be. I had never understood how much I had taken those short little hairs for granted. As a woman, I like to feel beautiful. I like being confident in the way I appear to the world. I had always thought if I were to lose my lashes and brows that I would look like an alien. Or even a hairless rat. Or maybe a hairless rat-like alien. Regardless, I had thought that if my brows and lashes were to fade away, my beauty would soon then follow. After all, I had never had to draw my brows on, and only wore false lashes on few occasions. What was I to do? I have an aversion to having all eyes on me. I don’t like all the attention. And, I don’t like being the sick girl. The cancer patient. Because of this, I’ve become somewhat of a chameleon. Not many people have been able to see me without my “mask” on. And frankly, because I appear to be healthy, it’s hard for others to see the face of sickness. 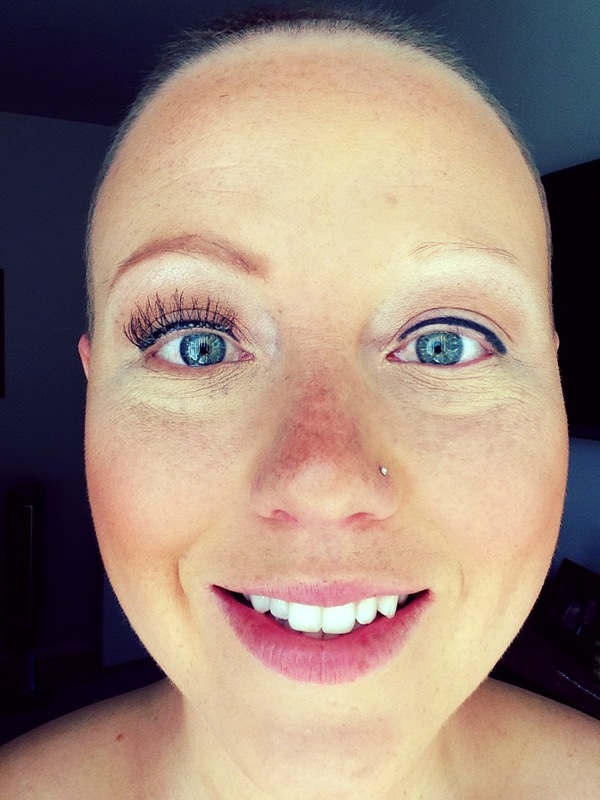 When I’m made-up, cancer doesn’t shine through. And while that’s the point, it’s necessary to see what the “before” looks like. 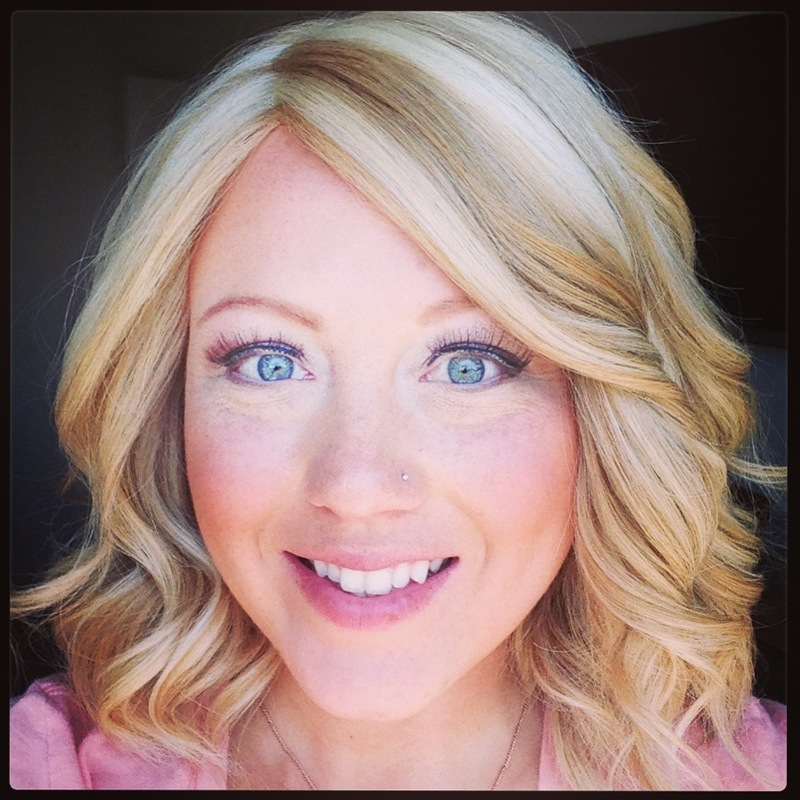 Many women share that they don’t feel femininely beautiful after hair loss. I get that. I feel that way, too. But there is hope. And thank the Lord for makeup! Gifted with cosmetic creativity, I have been able to gather my tools and tricks and go to work on the canvas of my face. 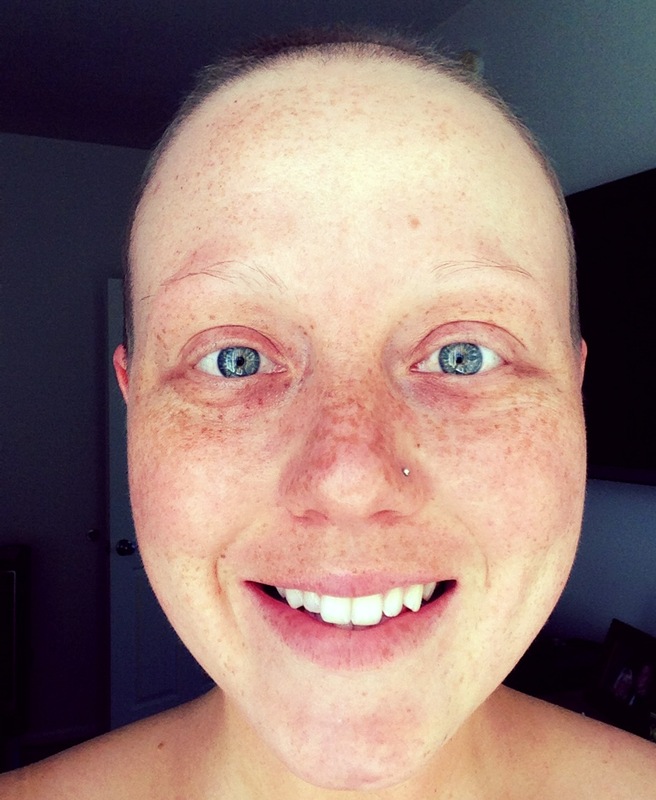 I am here to testify that as a woman diagnosed with cancer or for those suffering hair loss for other reasons, you can still be beautiful! Losing your hair does not mean you have to look vastly different from your prior furry self. It’ll take effort and creativity, but it is possible. Cancer tried to take away a lot. And even though it has tried to strip me of my appearance, I will not let it. No hair, don’t care. I’m beautiful, regardless. I have come to the realization that for the last 16 months I have only faced my disease (cancer), rather than coming head on with my diagnosis. This is not necessarily a bad thing, and for me, it has been beneficial to my fight. Until two weeks ago, I did not want to know the details of my diagnosis. 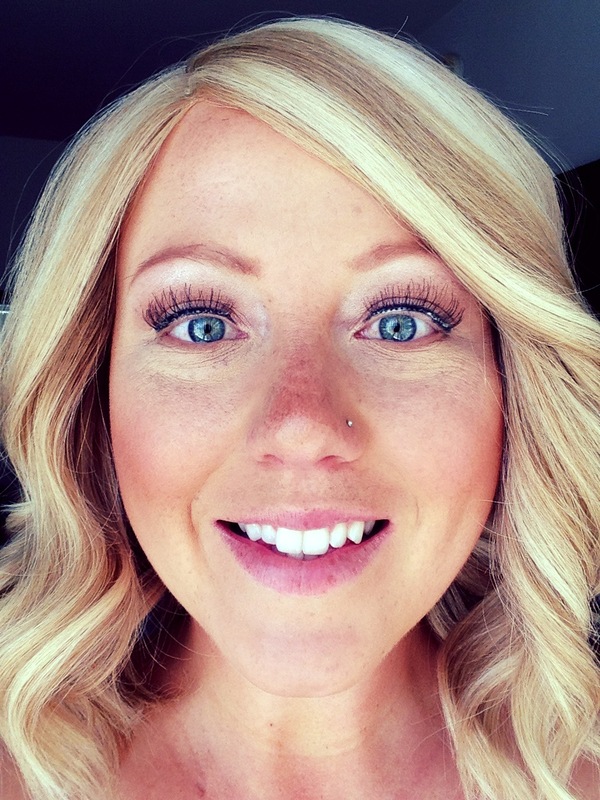 I knew that I had been diagnosed with a gnarly type of cancer called Large Cell Neuroendocrine Carcinoma of the Cervix, but the statistics did not matter to me. I felt that if I knew the ins and outs of my diagnosis, I would be brought to my knees in debilitating fear. After all, what I had been told already frightened me. “Rare. Poor prognosis. Less than 100 women worldwide have ever been diagnosed. Aggressive. Resistant to treatment. Recurrence is probable.” In fact, this diagnosis is so rare, there is only one doctor with any knowledge about it. And admittedly, he doesn’t know much. Those words gave me a sense of what I was up against, and I wasn’t ready to find out what this beast really was. I knew it’s identity, but didn’t care for it’s traits. Some may call this naive, but I assure you, this was my version of coping. I was protecting myself in the midst of the most weakest moments in my life. Had I learned the cold, hard facts about my diagnosis, I might have been crippled in times that I needed to pick up my shield and stand firm. Recently, I had an overwhelming sense that I was supposed to know more than just this beast’s name. I felt ready. Thus began my search. Previously, I had been told by several doctors that there really is not much research nor information about the specifics of my diagnosis, and that if I was interested, I could look at studies of lung cancers. Apparently they behaved similarly. However, instead of investigating cancers similar to mine, I wanted to know more about LCCC (Large Cell Carcinoma of the Cervix) specifically. I came across a helpful website created by my fellow “sisters” in this fight and the doctor studying it. Upon entering, I felt nervous, apprehensive, anxious… and ready. As I clicked on the “Education and Information” section, I knew I was turning the key to the door of reality. I began reading. What is it? Who gets it? What are the symptoms? How is it diagnosed and treated? And lastly… what is the prognosis? I paused for a moment and told myself, “Stop reading. You don’t need to know.” Yet as I was repeating these cautionary words, I could not stop my eyes from continuing on through the statistics. By the end of the section, I was relieved it was over. Relieved that I finally knew why my doctor cried after giving me this LCCC diagnosis. Everything that I had been told had been confirmed. This cancer is a jerk. Don’t get me wrong, all cancers are, but this one is the bully in the classroom that won’t give up. My heart still races as I share this experience. My human flesh is fearful and doubting. I’m not ready to die. I have an overwhelming number of things I still have yet to do here on this Earth. I have dreams, desires, and goals. Yet, with these feelings of fear, my hope is in something much bigger than my diagnosis. Someone exponentially larger than this mere irritant called, cancer. From the beginning of this journey, I have stood firmly in the statement that statistics are just numbers. They don’t matter. My life and death will not rely on numbers that people have put together, no matter how much or how little their research shows. My life and death are reliant on my Lord. He has the end say. 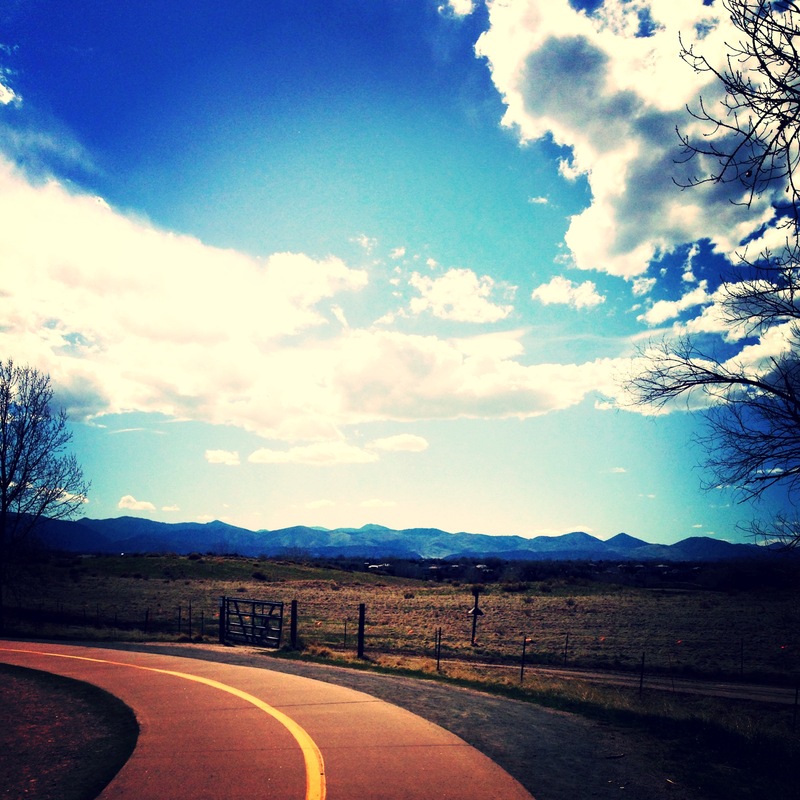 He directs my paths. He declares when the fight is over. Not the doctors. Not a website. Not a percentage. Not a number. I cling to my God’s statistics, and through Him I can be healed, no matter the prognosis. Statistics didn’t matter 16 months ago, so why should they matter now? Often we get trapped in what the world is telling us. Labels, titles, and diagnoses. We forget who has the first, middle, and last say of our lives. No matter how vast my doctor’s knowledge is, my God’s knowledge is incomparable. Our hope gets caged in the confines of a statistical box. We think that if a doctor tells us something, it must be true. While my intentions are not to undermine the immense research and knowledge that our incredible doctors possess, I’m simply saying there is someone higher than this. Often, in our flesh, we cling to the circumstance. Instead, we should be clinging to the promise. Clinging to The Creator, The Sovereign Director of our lives. Clinging to the hope for something greater than this. And that is what I’m choosing to do. 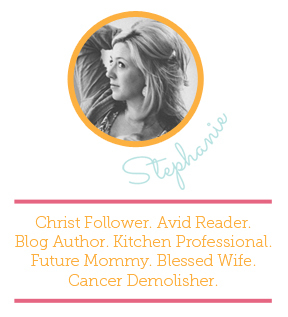 Since diagnosis, I have committed to standing in faith, having hope, and embracing joy. That doesn’t change now that I have read the statistics. If anything, it has concreted my faith, hope, and joy. Numbers vs God. Guess who wins that battle? Am I the only one who feels stuck inside of a bubble oftentimes? Maybe you don’t get out very much, stay inside a small radius of your home, or haven’t experienced as much as you would like to. Perhaps your life doesn’t cross the borders of your comfort level. For me, the diagnosis of cancer has continually tried to envelop me inside of it’s bubble. And sometimes, it’s quite difficult to escape. With frequent doctors appointments, trips to the hospital, and numerous days where I have been held hostage inside our home by my immune system, it’s often hard to get away. Sometimes no matter how hard we try to penetrate it’s walls, the cancer bubble keeps us contained. With this diagnosis and ensuing battle, finding time, energy, and health to enjoy a vacation has been nearly impossible. Key word: nearly. This past weekend, we hightailed it out of our bubble. We managed to escape it’s walls and fully enjoy a memorable adventure together. I haven’t had chemotherapy in over a month, so I have been feeling pretty good. My energy is still lower than I would like, but I am further along than I was four weeks ago. And yet again, God has placed a blessing in our lives… continual proof that He never leaves us. 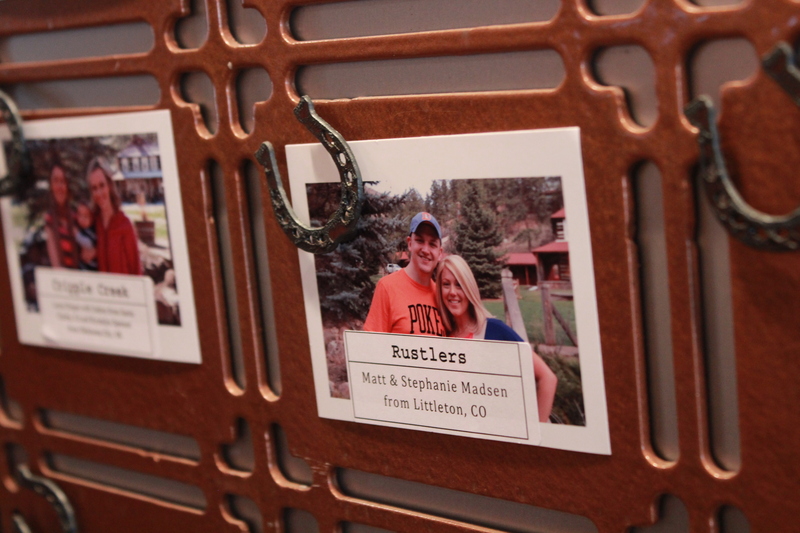 Months ago, we received an invitation from a family friend to spend a weekend at Lost Valley Ranch. Until a few weeks ago, we had found it difficult to get away. However, this past weekend we packed our bags, hopped in the car, and drove two hours through the mountains to arrive at our destination, the ranch. The incredibly majestic gem hidden away from everyone and everything. No cell service. No TVs. No internet connection (besides one “hotspot” in the dining hall). Therefore, no texts nor calls, no emails, and no appointments nor reminders. We were away from any distractions, and were able to focus without cancer looming over our heads like an unwelcome thunderstorm. This getaway ranked high on our list of memorable moments. In fact, we agree that it came quite close to our honeymoon in Cancun. Needless to say, it was a much-needed and long overdue break. And not only a break, but a fun-filled adventure. Something that has forever impacted our lives, and has touched us dearly. Memories we will hold close to our hearts for many years to come. 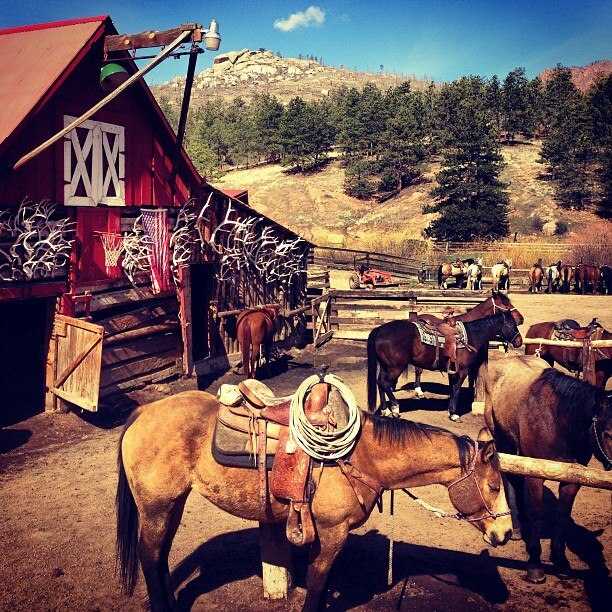 Lost Valley is a guest ranch; A dude ranch. Genuine cowboys and cowgirls. Horses… more than 100 of them. Ponds and creeks full of gorgeous trout. With multiple acreage, the number of activities to experience is practically limitless. They offer a gamut of activities for all ages, and everyone can be assured to have a fantastic time. The food and cabins are superb, and the staff is one of the best we have ever seen. They aren’t your typical “employees,” but are rather a large global family. One that you immediately feel a part of when you cross over the cattle guard and enter the ranch. It’s apparent that they are passionately focused and determined to be ushers of lifetime memories, and our gratitude for that is immense. This weekend we made wonderful friendships, roasted s’mores over campfires, square danced until we dripped with sweat, rode horses for hours, caught seven beautiful rainbow trout while fly-fishing, ate incredible food, saw breathtaking mountain views, caught a rare glimpse of five Bighorn sheep, and laughed until our sides hurt. I was brought to tears a couple of times because my heart was overwhelmed with such joy. This weekend will truly last a lifetime. We have come home feeling refreshed, renewed, and centered. 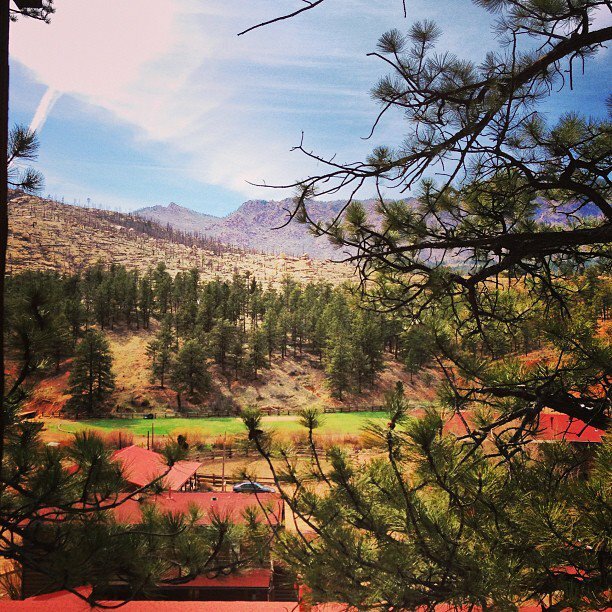 Our getaway proved more than we ever dreamed of, and we so look forward to venturing through the mountains and driving down the nine-mile long “driveway” to the ranch once again. Lost Valley Ranch is truly anointed. What they offer is priceless, and it’s obvious that God has His hand on their property. 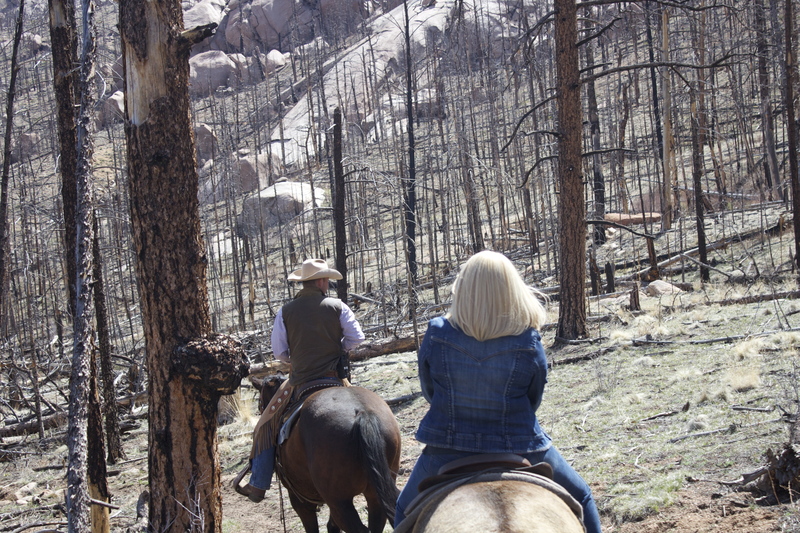 So obvious in fact, that during the devastating Hayman Fire of 2002, the ranch was completely protected from the flames. Surrounding all sides are vast miles of dead trees, yet LVR was unharmed. If you need to break through your bubble, I recommend journeying to Lost Valley. If you need to press pause on your daily life, check it out. 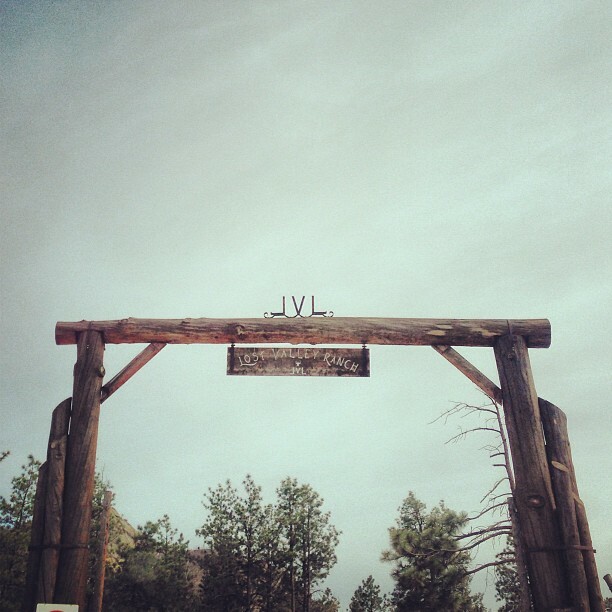 If you want to harvest memories that won’t soon be forgotten, Lost Valley is the place for you. Trust me. I’m a cowgirl at heart… peel back those city-girl layers, and soon you’ll find a boot-wearin’, horseback ridin’, fly fishin’ cowgirl. Wigs are aroma sponges. Get around anything with a strong scent, and rest assured, you’ll be sportin’ that aroma for a while. I’m still debating whether I want to wash the campfire smell from my locks. It reminds me of the square dancing, s’mores, and riding we delighted in. Cancer can’t steal memories. So make as many as you can. Denim on denim is appropriate cowgirl attire. Southern accents rub off. Pretty soon I was slingin’ cowboy lingo in no time flat. God continually surrounds us. When you can’t see or feel Him, have faith that He is there. He will always show up and show off. Bubbles are not impenetrable. Break through one and you’ll discover life in an entirely different way.